Highly Absorbent Waffle Drying Cloth. 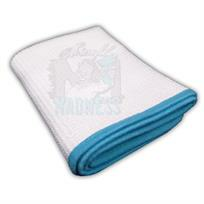 The Waverider Junior drying towel has been developed with typical Microfiber Madness quality in mind. Super absorbent the Waverider has the highest weight of all waffle weave drying towels on the market, so you can be sure it's effective! Made with a smooth microfibre edge rather than the usual satin bound edging found on most towels, the Waverider is safe for even the most delicate of paintwork.